FREE Oil with Every Shredder! Keeping your shredder well lubricated is an essential part of ensuring the long, smooth running of the unit. After a period of time shredders that are not oiled will start to shred fewer sheets, be prone to jamming and may affect your manufacturers warranty. High quality materials, proven quality – the reliable security partner in the workplace. 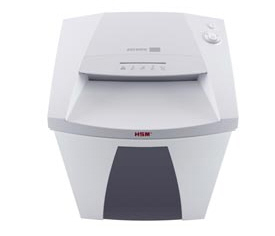 With an intake width of 310 mm, the document shredder effortlessly shreds DIN A3 paper. It is the perfect device for working groups from five to eight people. High quality materials and "Made in Germany" quality for safety and durability. With 3 years warranty. Powerful motor allows for continuous operation. Quiet operation minimises noise development in the workplace. EcoSmart: Particularly low power consumption of 0.1 watts in standby mode. Blue Angel: The document shredder is awarded for its sustainability. Paper feed with overload protection reduces paper jams. Safety element prevents unintentional entry and serves as a splinter shield. Multifunction element for intuitive operation. Light barrier for automatic start/stop. Convenient removal and emptying of the removable reusable collecting bag. Separate collecting bag for the sorted separation of the shredder material. High quality wooden floor cabinet with door. Dust emission tested by independent institute: Use directly at the workplace is harmless. Level indicator through inspection window.